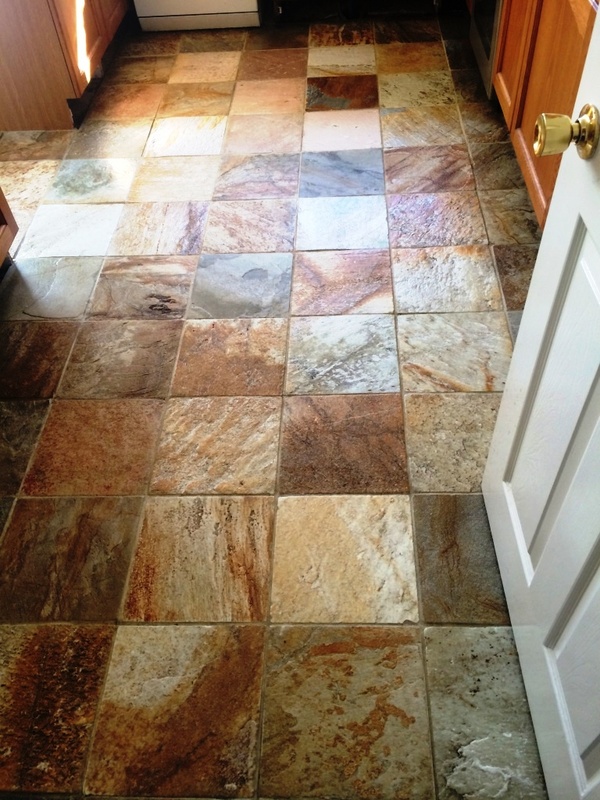 This floor was installed in the house of a client in the town of Trowbridge, Wiltshire, I was asked if I could restore the Slate tiled kitchen floor back to its former glory. The client was having trouble cleaning the floor themselves due to the sealer being worn away and dirt now becoming ingrained into the pores of the slate. I suspect the life of the sealer had been reduced by the use of in-appropriate cleaning products; anything even mildly acidic will overtime eat away at the sealer and reduce its life. Upon arriving at the house, I undertook some test cleaning to demonstrate to the client the results I would be able to achieve. 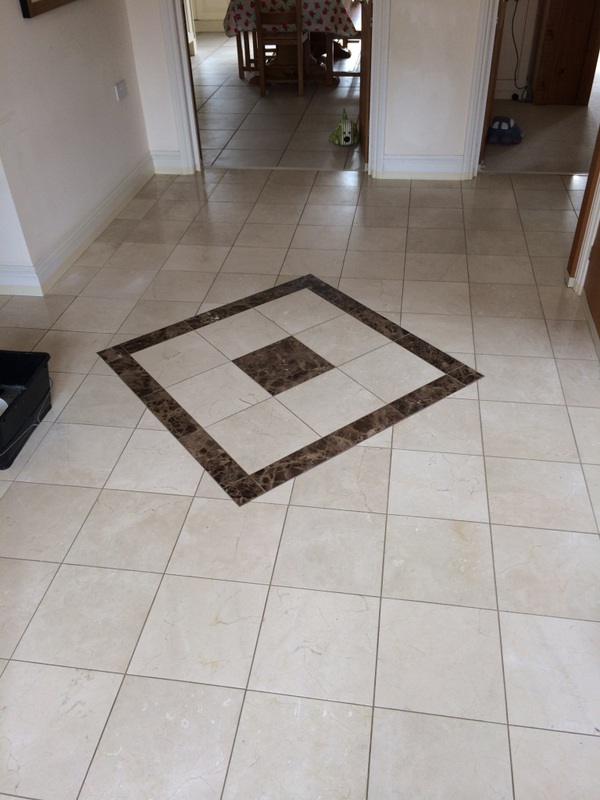 Seeing how quickly I would be able to make a marked difference to the appearance of the tiles, the client quickly commissioned me to undertake a clean and seal for the entire floor. 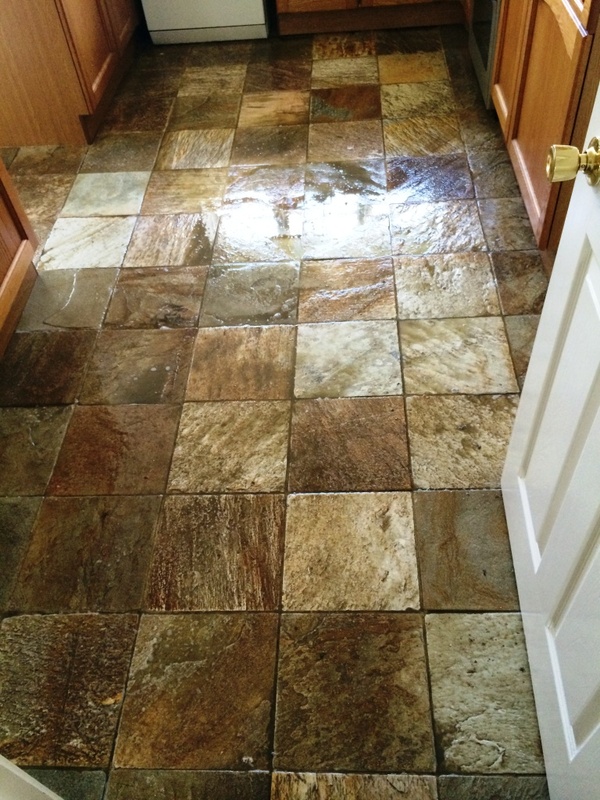 My first task was to mix a solution of Tile Doctor Pro-Clean and clean water. This was then applied evenly onto the floor and left to dwell for 15 minutes, allowing for the strong alkaline cleaner to soak into the stone to get underneath any ingrained dirt, and lift it to the surface. Once the solution had rested on the surface for a short while, I paid particular attention to the grout lines, scrubbing them with a stiff grout brush. Next, I attached a polybrush to a rotary machine and scrubbed all of the tiles thoroughly. I then used a wet-vac machine to soak up any resulting residue. However, upon further inspection, I noticed some further paint splashes and grout haze. I applied Tile Doctor Grout Clean-Up to tackle the evident grout haze, and used a heavy duty scraper to remove the paint splashes. Once my client and I were happy with the result, I vacuumed up the slurry and gave the entire floor a thorough rinse. It was then left to dry completely overnight. I returned the next day to seal the floor. Firstly, I tested the floor for evidence of damp using a damp meter and, once I was happy that there was no excess moisture to potentially damage the performance of the sealer, I proceeded to seal the floor using Tile Doctor Seal & Go, which provides a durable surface seal and leaves an aesthetically pleasing sheen finish. I applied a total of six coatings of the sealer, resulting in a marked difference in the appearance of the tiles (as you can see from the photos). She was very happy with her refreshed floor, and I left her with some cleaning and maintenance advice for the future, before making my departure. 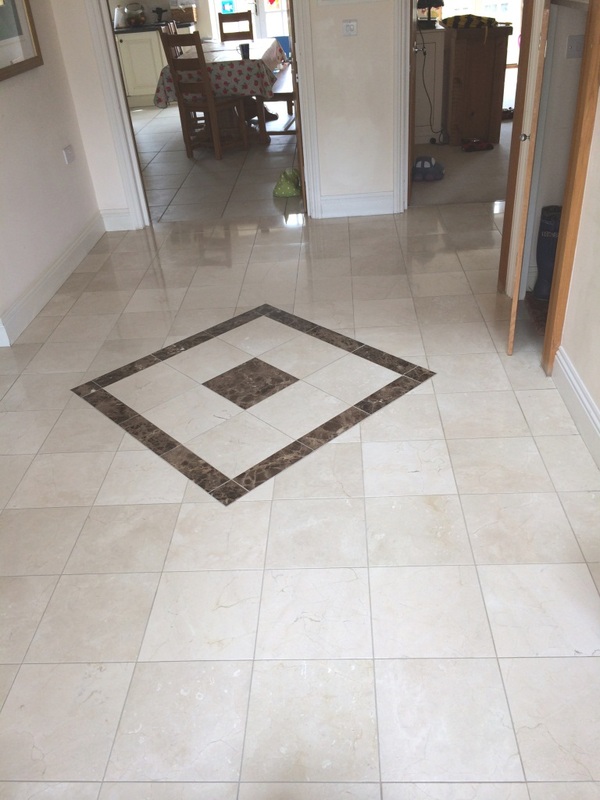 The owner of this polished Marble Tiled hallway at a house in Trowbridge was unhappy with the look of their floor which had become dull and scratched and wanted the floor re-polishing. Apologies in advance for the pictures below on reflection I should have taken some close-up shots so you could see the problem better. The first step first was to give the floor a general clean focusing on the grout lines so I started by mixing a mild dilution of Tile Doctor Pro-Clean which is an alkaline based product that is safe to use on Marble. The solution was brushed around the floor concentrating on getting the product into the grout lines. I left this to dwell for 5-10 minutes before scrubbing with stiff grout brush. Once the grout lines were cleaned the dirty solution was removed with a wet vacuum and the tiles rinsed thoroughly with clean water. The next step was to burnish the floor using a coarse diamond encrusted pad fitted to a rotary machine. This is used with clean water to remove surface scratches and any sealer that may be present. Once the water has turned to slurry after 4 passes of each tile I would remove with a wet vacuum and rinsed thoroughly. One that step was completed the process is repeated using the Medium, Find and Superfine polishing pads which in turn will gradually re-polish the surface. Between each pad I would remove the slurry using wet vacuum and rinse thoroughly. The floor surface was now restored but still too wet to seal so I called it a day and returned the next day to seal the tiles. On my return I checked that the surface was dry enough to seal using a damp tester which came back OK. My first job was to add an extra shine to the floor by polishing it further with a green buffing pad. Next I sealed the floor using two coats of Tile Doctor Colour Grow which enhances the colours and also protects against future spills and stains etc. Once the seal had dried sufficiently I used a white buffing pad to give one final polish. Upon completion I gave the customer some cleaning tips including the use of Tile Doctor Neutral Tile Cleaner to prolong the life of the sealer; unlike acid based sealers it won’t damage the sealer every time you clean the floor.